This is a fan translation. Do not copy and repost anywhere else. Please note that certain parts not critical to the plot are summarized and not fully translated because the novel is very long. Thanks for translating. I love Chinese stories but don’t speak or read the language, so I’m grateful you’re painstakingly translating all these for the world. Can’t wait to read on what happens! Thank you for translating. After I read your translations I couldn’t wait anymore and went out and bought the Vietnamese version of this book. They don’t have it here, so I had to have it shipped express from Vietnam to the US!! I didn’t eat or sleep and finished it in over 1 day and have read it 5 times already. It is so good! It made me laugh, make me cry, I hope the drama lives up to the book. I’m so excited for the drama to come out! Even though I already read it, I’m still interested to see your translated version. My brother doesn’t read Vietnamese, so I’m having him read your translated version. Thank you for all your work!! Wow, 5 times already! You probably know the book better than me :D. You can find good book recommendations here: http://www.books.shushengbar.com/. Your brother can read more English translations here: http://www.books.shushengbar.com/?page_id=27. Which website did you order the books in Vietnamese from? I want the Viet translation too but I don’t know how to have them shipped to the US. I only have time to work on this on the weekends :(. I’m sacrificing a lot of my personal time working on this novel already. I can’t spare any more time because I’ve got a lot of things to take care of in my personal life as well. Thank you very much for your explanation. Just can’t wait till the film will appear on youtube. By the way,has bai z hua ever hated hua q ku deeply? I’d argue that BZH loves HQG the most out of all the characters in the novel. You’ll see in the story that BZH is very strict, but when it comes to HQG, he’s always willing to bend the rules to help her. Where he fails is that he mistakenly thinks he can save both the world and HQG. To BZH, the safety of the world is the most important thing, even more important than HQG and himself. Hi, just wanted to give you a huge thanks for doing this! I really appreciated it, and it brings me joy to read something different every once in a while 😀 Wish you all the best. Spoiler: BZH willingly agrees to be imprisoned by HQG. Despite everything, BZH and HQG never hate each other. Lidge, what another sacrifice to be imprisoned by hqg. This novel is very romantic. The imprisonment occurs at the end of the story where BZH thinks if he becomes HQG’s prisoner and lets her punish him however she wants, it’ll lessen her resentment so she won’t do bad things. In the trailer when BZH is HQG’s prisoner, she asks him if he loves her and he answers it doesn’t matter if he loves her or not. Maybe the English dubbing is kind of bad so it’s hard to understand :D.
BZH is always willing to sacrifice himself if he thinks he can save the world through his sacrifice. If there’s a weakness to BZH’s personality, I’d say it’s his kindness. It’s this kindness that made him accept HQG as his disciple, thinking he can help save her from her tragic fate. This action unknowingly starts the chain of events in the tragedy. And later on, the more he tries to protect HQG and covers up her mistakes, the worse everything becomes. The story right now is setting up all the characters so it feels like nothing’s going on. However, the story will pick up and become very heart-wrenching and good. Actually, when I first read this novel, I dropped it a few chapters in because it seemed boring :P. I’m glad I gave it another chance because I ended up loving it. And now I’m translating it :D.
Ah ha, you are translating this novel cause you love the book and wallace huo. Since i can’t speak chinese, i’ve to see the thriller in english version. Cause ‘the action’ looks exciting,i just drop the dubbing which is sometimes really difficult to catch the diallogue. Bzh should have special feeling for hqk since the beginning. Kindness only is insufficient for bzh to have much willingness to change hqk’s tragic fate. I love this book, but I also love a lot of other books so yes, I’m translating this particular book because Wallace Huo is BZH :D.
All readers have different interpretations, but this is mine in regards to BZH’s feelings specifically based on HQG’s age throughout the story. If this important fact is overlooked, it’s easy to mistake poor BZH’s good intention and he’ll seem bad. HQG is 13 yrs. old right now. It’s true that BZH has shown preferential treatment for HQG, but it’s partly out of sympathy and partly because he admires such tenacious courage in a kid. BZH is very kind, and this fact is reiterated many times throughout the novel. It’s normal for him to feel sorry for HQG. All the other students seem to belong somewhere and have family and friends, and some even have great backgrounds like NMT. HQG is the opposite. She’s an orphan from nowhere, not to mention everyone shuns her because of her inauspicious aura and tendency to bring misfortune to everyone close to her. He foresees that her fate is tragic so he decides to try his best to change her fate. Some readers don’t like BZH because of how he treats her later on, but for me, I’ll always like him because of the kindness he shows HQG in the beginning. When she needs someone the most, no one helps her except for him. Another reason why HQG stands out in BZH’s eyes is because of her tenacious courage. She says she wants to be his disciple, and she lives up to that promise by training very hard to catch up to the other students. The progress she makes is huge because she studies for 6 months and yet makes it to the semi-final of the Xian Jian Games, not to mention she literally risks her life because she wants to win so badly. BZH knows all of her hard work, her intense training, her fervent wish to be his disciple so he decides to take a chance on her and try to save her. BZH’s feelings for HQG is complicated to explain clearly. I’d say it’s a gradual transition. First it’s sympathy for a young orphan. Then after she lives with him for several years as his disciple and becomes in a way his closest family, the sympathy turns into genuine care and concern. It’s not until much later near the end of the novel when HQG has grown up, I believe she’d be around 18-20??? yrs old that his feelings turn into romantic love for her. But then of course, love is very complicated to explain. There are many facets of love. It’s particular difficult to clearly define for BZH and HQG because they’re together for so long. For BZH, at what point does sympathy turn into genuine care and concern and then turn into romantic love? All readers have to make this judgment themselves. The author is vague on BZH’s feelings so it’s up to each person to interpret how BZH feels. Personally, I believe he has come to love her in the romantic sense by the end of the story or he wouldn’t be destroyed by what happened to her. I agree that someone who’s reached the highest level of enlightenment and is emotionless like BZH wouldn’t easily fall in love, but do remember that HQG is a special case. She’s not like the other women, she’s his fated calamity. Her fate and his fate are destined to be linked together. If I remember correctly from the novel, only 5 immortals managed to reach the highest level of enlightenment. They form a close group consisting of BZH, Zi Xun, Dong Hua, Tan Fan and Wu Gou. Zi Xun falls deeply in love with BZH, but he doesn’t return her feelings. Her love leads her to commit crimes against the immortal realm so she’s banished, and she ultimately joins the demon realm. This breaks up the friendship between BZH and Tan Fan because Tan Fan loves Zi Xun and blames BZH for not doing more to help Zi Xun. Wu Gou’s story arch is interesting because he’s also tested with a fated calamity similar to BZH. Like BZH, he chooses not to kill the girl and eventually, he turns demonic. Later, he tries to kill HQG because he knows she’ll ruin BZH, but BZH rescues HQG in time. Only 4 eps have aired in the drama, but I’m guessing the drama will be similar to the novel in regard to this part. Already, we see Tan Fan resenting BZH for not doing anything to help Zi Xun, and Zi Xun is committing crimes that will eventually causes her to be banished. And in the trailer, I saw Wu Gou accusing HQG of being BZH’s fated calamity and trying to kill her. I’m not sure how the drama will deal with Dong Hua because he doesn’t have a story of his own in the novel, unlike the other 4 in the group. Thanks, lidge. I suppose you are right. She is FATED to be ‘his calamity’. And the calamity is ‘falling in love with each other’. I saw the ep where Bai Zi Hua checked past records and none escaped their ill fates. That sets the story up for the tragedy? I heard Mo Bingxin is supposed to be another man and not Bai Zi Hua in disguise.? I believe the calamity is not falling in love, but it’s when that love forces BZH and HQG to take actions that they know will destroy them but they still do it anyway. In the novel, Mo Bing is a minor character who appears briefly toward the end. Supposedly, he looks similar to BZH. I’m not sure what the purpose of the character is except to confuse everyone why he’s even in the story. But if head over heart, then no story for us :D.
Lidge,thank you very much for your explanation…..excellent!. I saw the thriler:bzh’s teacher (an old man) has ordered bzh to kill without mercy. Do i miss the chapter which you’ve already translated?. Can’t believe I wrote such a long essay, reminds me of when I was in school, shudder!! shudder!! :D. When analyzing BZH’s feelings for HQG, do take into consideration her age. The novel mentions BZH’s master briefly in that he gave BZH the Emotionless sword, but the novel starts out with BZH already being Chang Liu’s sect leader for many years already. The old man in the trailer is BZH’s master, but I don’t know if it’s a flashback or he’s still alive in the drama and then dies and BZH replaces him. Lidge,you should start writing novels. Who knows wallace huo would play as the main character for your novel. Chances are Wallace won’t like my nonsense writing :P. I don’t even understand what I write sometimes :D. Much better if I just fly to China and chase him. My strategy to win his heart will need to be swift and powerful like the Emotionless sword so poor Wallace won’t know what hit him :D.
I suppose if the novel becomes a hit, Wallace and I can star as ourselves in the drama adaptation :D.
Hahaha,what a dream! Hopefully, wallace reads your blog and fulfill your wish…..
By the way, have you ever contacted fresh guo guo that you are translatting her novel? To be honest, i don’t like reading novels. I usually read comics..
Ooo, perhaps is there journey of flower in manga version? They do have Journey of Flower in manga version, only volume one is out though. I’ve read the Vietnamese version, but of course there is also the original Chinese version. They are currently working on the next volume. From what I know it is approved by Fresh QQ. Patricia, you can find mangas based on TJOF and other C-novels at Peanuts’s blog https://hui3r.wordpress.com/2013/09/08/novels-adaptation-manhua-comic-%E6%BC%AB%E7%94%BB/. Mina and Lidge, many thanks for your info. Oeps, i can’t understand chinese….hiks,hiks. Perhaps i could find in english version for tjof’s manga. Hey Lidge! Thanks for spending so much of your time on translating and sharing this novel! I’m an avid fan of yours from now and forever!! I opened my wordpress account just to comment here! Thank you! Thank you so much! If you can refer other novels to me, I’ll be really grateful! Since I’m an avid reader, I keep on trying to find good novels. Thanks again!! So sorry I couldn’t reply sooner :). 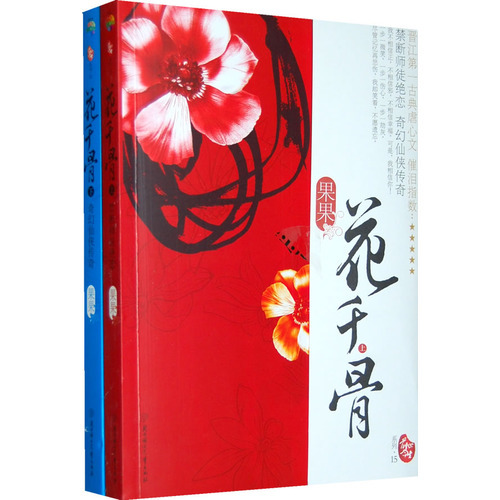 You can find a lot of good info about Chinese romance novels at SSB http://www.books.shushengbar.com/. What I do is if I like any book, I’ll search to see if the author has written anything else. That’s how I find a lot of good books. 1) Gu Man http://www.books.shushengbar.com/?cat=104: GM has a special place in my heart because GM’s book Shan Shan, Come Eat! http://www.books.shushengbar.com/?p=1765 was one of the first I read and her book Silent Separation http://www.books.shushengbar.com/?p=396 sealed my love for Chinese romance novels :D.
2) Fei Wo Si Cun http://www.books.shushengbar.com/?cat=124: FWSC’s books usually end shockingly sad so best not to read them if you prefer novels with a happy ending. I don’t think there’s anything special about FWSC’s plots, but I really like her writing style so I’ve read all of her books because of that. Usually, most writers will have a distinct writing style that can’t change, but when I read FWSC’s books, I feel her writing style will change to fit the plot, be it funny, sad, etc. It feels like her books are written by a different person each time, and I like that. 3) Ye Luo Wu Xin http://www.books.shushengbar.com/?cat=106: YLWX’s books are addictive because of the angsty plots. 4) Tang Qi Gong Zi http://www.books.shushengbar.com/?cat=7: Very talented writer, one of the best Chinese romance writers. TQGZ’s books effortlessly combines humor and tragedy, which is hard to do, yet TQGZ does this very well. 5) Dian Xian http://www.books.shushengbar.com/?cat=126: Very funny writer!!! 6) Xin Yi Wu http://www.books.shushengbar.com/?cat=15: One of my favorite writers!! I’ve read all of XYW’s books except the newest one. XYW’s strength is her descriptive writing, which pulls the readers into her stories. Also, I love her lead female characters because they’re strong and independent. Her most famous novel is probably So Young http://www.books.shushengbar.com/?cat=15, but my favorite is Let Me Look At You http://www.books.shushengbar.com/?p=573. 7) Jiu Xiao Qi http://www.books.shushengbar.com/?cat=152: Funniest writer I’ve ever read!! 8) Ding Mo http://www.books.shushengbar.com/?cat=147: DM’s books cover all genres. I only like her crime novels When A Snail Loves and Close Your Eyes. I feel I should still mention DM because her crime novels are very good! Any plans to complete the translations? Klutzyfeli has continued where I left off and will translate until end of August. She’ll post updates at her blog so please check https://rainingstardust.wordpress.com/. Mina, the other translator on our team, wants to finish translating the book, but she can’t work fast because she’s busy. I can help from time to time with a few chapters. We want to finish translating the book, but I don’t think it’s possible for us to finish before the drama finishes airing in September. The beginning of the drama is somewhat different from the book to introduce all the characters quickly, especially BZH. However, I feel that the drama will probably gradually follow the novel based on the trailers and filming pics that have been released so I don’t think you’ll miss much if you haven’t read the latter part of the novel. I would like to extend my sincere appreciation to you all who spare your precious time to translate this novel. It doesn’t matter if it couldn’t be completed on time. It’s a big volume and understandable. Thank you once again for all the efforts. how about chapter 61? why i cant open it.. ? Don’t think it’s being translated yet. Lidge, can you explain the background of Shuo Feng more? Does he like HQG? He seems so secretive and I can’t seem to read him. Sometimes I get the feeling like he likes NMT but sometimes it seems he is interested in HQG. If you can explain I would greatly appreciate it. Thanks. In the novel, there are 16 holy instruments that when united will resurrect the Demon God. One of the holy instruments is the Nuwa Stone. SF is actually a fragment of the Nuwa Stone that turns into human. He doesn’t like HQG or NMT because he’s a stone so he doesn’t have any feelings. He’s nice to HQG because she’s a nice person. Not sure if SF’s story is the same in the drama though. Thank you again for allowing me to make reference to your website. I don’t know because I read everything online. I don’t know anyone who owns a hard copy and can check for you. Oh okay, no problem. Thanks!!! Thanks for the translations. I have really enjoyed it and loved your translation style. Hello! Can you please translate the additional silly epilogue called ‘five husbands home-coming’. Where Qian Gu married Na Mo Yue, Xuan Yuan Lang, Dong Fang, Sha Qian Mo and Bai Zi Hua simultaneously so all five become her husbands? I would really appreciate it! Also, if you know where I can find English fanfic of pairing Qian Gu x Sha Qian Mo, please do tell! A BIG THANK YOU for all the efforts! when r u posting chapter 77 to 80?its been do long.even the drama have ended. New reader here, I stumble across this site because I’m a n00b. Thanks for translating even if its not complete. I hope it will be completed one day though. I came here from watching the drama even though it ended, but I heard about a 2nd Season drama of Hua Qian Gu but its modern??? I’m just very confused as does that happen in the Novel as well? Hello there. Yes, there is a modern version of Hua Qian Gu. It’s currently airing on iqiyi. The modern version is not part of the novel, but it is a continuation from the ancient Hua Qian Gu series. Please know that the book has been revised several times so the plot changes depending on which version you read. http://www.ybdu.com/xiaoshuo/7/7434/: This is the version being translated by klutzyfeli and me. I think it’s the only version with a happy ending but only includes the gamble epilogue. http://www.siandian.com/xiaoshuo/huaqiangu/: ebook link posted by SL in the Discussion Corner. She said it has all the epilogues. I don’t know which version this is though. http://www.yousheng8.com/yousheng/25877/: audiobook link posted by steffyjames. This is the same version being translated by klutzyfeli and me. If you’re in the US, you can buy a hard copy from Amazon. I see http://www.amazon.com/Faerie-Blossom-Chinese-Guo/dp/7540467770/ref=sr_1_1?ie=UTF8&qid=1441906974&sr=8-1&keywords=hua+qian+gu and http://www.amazon.com/Faerie-Blossom-Qian-Love-Chinese/dp/7540471735/ref=sr_1_2?ie=UTF8&qid=1441906974&sr=8-2&keywords=hua+qian+gu. The latter one with Wallace and ZLY on the cover is probably the newest edition. I heard the ending for the newest edition is open ended with BZH finding a mentally impaired HQG. Someone in Soompi said YesAsia also sells the book http://www.yesasia.com/global/xian-xia-qi-yuan-zhi-hua-qian-gu-yi/1043947324-0-0-0-en/info.html. Based on the cover and release date, I’m guessing it’s one of the earlier versions, which might not have the epilogues. Hi, i like to say thank you for the translation of the book, it do help a lot . wondering where 77,78 & 79 translation ??? Hoping that you have time to translate more, been waiting for updates. thank you for translating this book drama. I am so addicted to this drama and impatiently waiting for the dvd version. again, thank you, and please spare some of your time to continue translating this book. I’m fine, dear. Hope you’re well too and have found a job already. I’m a girl from India. I have been interested in Chinese culture and stories right from the time I watched the disney movie Mulan. After I came upon this novel, I find it hard to take my eyes off the screen while reading each chapter. Your translation skills are amazing! I’m so hooked! When I got to the end of what has been translated I was crying for more. I saw it’s been left alone for months now. Is there anyone finishing the English translations or a detailed summary? Will you be translating any more of this novel? I really enjoy reading this and also the drama was excellent! Thank you for all your hard work and I look forward to more translations if you are doing it again. please translate the whole novel for us non-Chinese readers to appreciate…. please please please! hahahahaha…. Are you going to be translating any more of the novel? It is very well done! Hellooo… please translate the whole novel. I do not read/write Chinese so this site is the only “lifeline” I have hehe. Can I please check if volumes 5-7 (ch 90-139) have been translated to English and if so could you please advise the link please? thanks so much for translating this novel. This is a very lovely drama and impatiently waiting for the uncensored version if ever will get to see the deleted scenes on tv or dvd. Hope its not too much to request that you may be able to spare some of your time to continue translating this book. Waiting so earnestly…..you are really to be respected for this work!!! Hi Thank you so much for translating. . but you left me brokenhearted when I can’t find the finished English translation of the whole novel. . Pls help us get the link of the continuation of the English translation of the rest of the chapters. I am forever grateful. .